Definition at line 141 of file Cmt19937.h. Default/Named constructor. Seeds the random number generator with the given seed. Definition at line 248 of file Cmt19937.cpp. Produces a uniformly distributed random number in 0 <= x <= 1. Definition at line 253 of file Cmt19937.cpp. 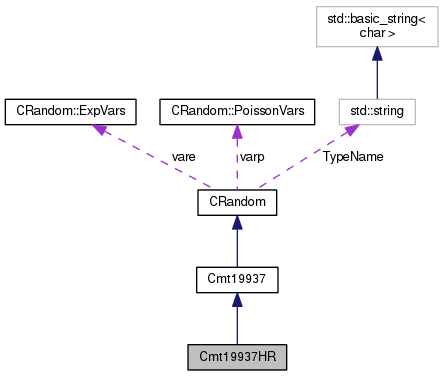 References C_INT32, Cmt19937::getRandomU(), and CRandom::mFloat. Produces a uniformly distributed random number in 0 <= x < 1. Note: 0 < x <= 1 may be achieved by 1.0 - getRandomCO(). Definition at line 260 of file Cmt19937.cpp. Produces a uniformly distributed random number in 0 < x < 1. Definition at line 267 of file Cmt19937.cpp.